If you have a Honda Civic, chances are you have paint problems. And actually it is not limited to just Honda Civics. Certain CR-V’s Honda Odyssey vans and Honda Pilots are also prone to paint issues. In fact the paint problems with Honda are so bad, that there are now Facebook pages dedicated to the subject. There is even a class action lawsuit that was filed against Honda. Obviously these paint problems take a few years to show up in a brand new car, so what are you supposed to do if your car is only a year or two old but is mechanically beyond the three year, 36,000 mile warranty? I have good news, sort of. Honda has extended the paint warranty for your Honda to seven years from original manufacture date and regardless of mileage if it is within certain years and models and can meet certain criteria. The catch is, the warranty does not cover the entire paint job on your car, and it only covers certain areas. The second catch is, much like my lifetime warranty article here, the warranty can be voided for natural causes and issues such as stone chips and dings, and it may only cover your car was ORGININALY sold in one of the 25 northern states covered under the warranty and may only cover some colors. But if your car meets all the qualifying criteria, Honda says it will extend the warranty coverage on 2006-2013 Honda Civic sedans and coupes, for problems with chalking and cracking for seven years. The new warranty terms came from newly issued Technical service bulletins from Honda between January 2013 and November 2013. If you own a 2006-2011 Honda Civic, 2007-2011 CR-V, 2009-2011 Pilot, or 2011-2012 Odyssey with cracked or peeling paint, you may qualify for a free fix at your local Honda dealer. The Honda Technical Service Bulletins (TSB’s) state that on affected vehicles, the paint on the roof and leading edge of the front fenders may crack or have a chalky or cloudy appearance. Also the roof, trunk, upper portions of the quarter panel and upper portions of the doors could also display this same chalky or cloudy appearance. This bulletin will expire on 9-30-14 for 2006-2008 vehicles. As stated before, this warranty extension does not cover any other paint issues such as rock or stone chips, scratches, bird dropping damage, tree sap, acid rain damage, exterior rust, etc. Also worth noting is that the warranty only covers factory applied paint. So if you have had any body work done, to any of the areas, you can forget getting Honda to fix the paint for free. Your best bet is to go back to the body shop that did the work and get them to cover it under their paint warranty. Finally, this warranty extension does not apply to a vehicle that has been declared as a total loss or sold for salvage by a financial institution or insurer, or has a branded or similar title under any state's law. So if you purchased a car with a salvage or a rebuilt title, even if the damages had nothing to do with the paint (such as a theft recovery or some time of water damage), you do not get the extended warranty coverage. So what do you do if you qualify for the extended warranty? Take your car back to your local Honda dealer who will then inspect the paint and if you qualify for a warranty repair, the dealership, will repaint the affected areas entirely. Not all Honda dealerships have their own body shops, so chances are you could have your car sent to a local auto body shop. If you want to verify if that body shop does quality work and has a good reputation, you can check them out by reading their reviews here. For more info or answers to questions regarding this warranty extension, call Honda direct at 800-999-1009, and reference Campaign # 14-034, entitled: Paint Chalking, Cracking, Clouding Warranty Extension. The warranty extension does not cover the bumpers, front doors, bottom half of quarter panels, or the bottom half of fenders. So what about other Honda models and Paint problems not covered under this warranty extension? 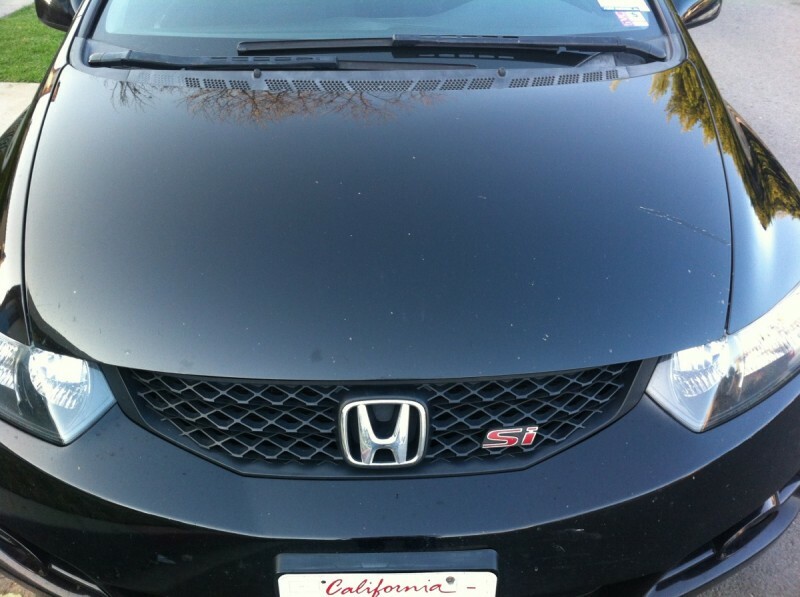 There are many Honda owners who are bringing their car to their local Honda dealer and being told that the paint problems are stemming from normal wear and tear on the vehicle. Don't take no for an answer. While most modern OEM paint jobs do fade and experience some paint issues over time, especially those in very sunny or hot areas, this oxidation can typically be buffed and polished up. The peeling and flaking paint is a much bigger problem, one that buffing cannot repair. If you feel like your car’s paint is not performing properly, but you are not covered under the warranty extensions, there are some class action lawsuits being filed that might help you get some resolution, but it may take a long time. You could also get estimates to re-paint your car and consult with an attorney to see if you have a legitimate case against Honda, or might even be covered under some type of lemon law provision in your state.